The Sydney Opera House, designed by Jørn Utzon, opened October 20th, 1963. It quickly came to be regarded as a modern architectural marvel. Now, 40 years later, this UNESCO World Heritage Site has the epic Lego model it deserves. It's nearly-3,000 bricks of Lego beauty. And believe me, this thing is HUGE! The Sydney Opera house is the latest addition to the Lego Creator line (along with the Eiffel Tower and the Taj Mahal). 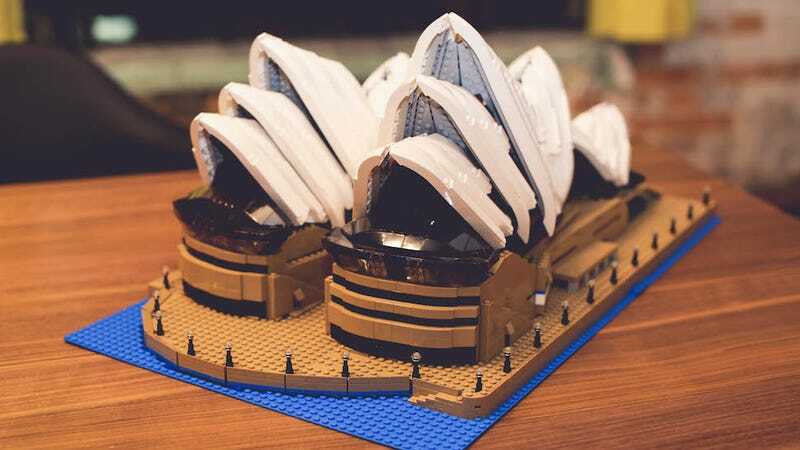 Lego's first attempt at the Sydney Opera House came with a set from their Architecture series, that was a mere 270 pieces, which left much to be desired. Finally, the Lego design team has created a set that truly captures the iconic art center, in all its geometric splendor. The build measures at over 11" (28cm) high, 25" (63cm) wide and 15" (38cm) deep. It features some pretty kickass new building techniques. What stood out the most was the construction of the roof. The opera house's signature sloping shell roofline is beautifully-recreated in this build. To me, the sloping pieces resemble a stormtrooper's armor. There are loads of incredible details, many of which are super subtle. And the construction is very complex. The set includes "rare 1x1x2/3 stud and 1x2x2/3 stud slopes, as well as a 48x48 stud baseplate in blue for the very first time." It's a pretty stable model and easy to move around, which is important when you spend several hours (or several days) on a build. The bricks are divided into 4 bags, which are numbered, and each bag has it's own instruction book. This makes it a fun set to build either on your own in one killer session, or over the course of several days, or build it in tandem with someone. Overall, this is one of the best Lego sets I've played with and it would make an awesome Christmas present.